Josh and Hazel ♥️ They are the best! I think they are the best couple so far, that CLo have written. I had so many that I wanted to include (like every couple from the True North series LOL) and it was hard to narrow it down. I love seeing Griff and Audrey on your list. ♥ And Stella and Michael, of course. *sigh* I really need to read Josh & Hazel soon!! I wanted to add ANOTHER Bowen couple (Lazarus and Callie from Falling from the Sky), but I wanted to spread the love around. Read Josh & Hazel!!! It was so fun! Josh and Hazel is another I really need to read... So many good things are said about it. I love all Bowen's books, and Bittersweet really made me appreciate farmers. 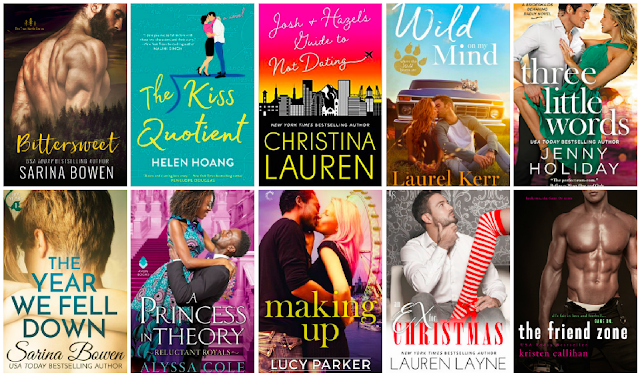 I haven’t read any of these because I avoid romance-focused books, but The Kiss Quotient has been on pretty much every TTT I’ve looked at today. I guess they’re a popular couple! I know there are non-romance readers out there, but I love the genre. You would think as a spinster I would be bitter, but I love reading about love and people finding their HEA with each other. Stella and Michael were an incredible pairing. Hoang really upped the game with The Kiss Quotient. Love all these couples! Especially Audrey and Griffin, Stella & Michael, Gia & Bennet, Ledi & Thabiso, Trix & Leo and Kelly & Mark! Some of my favoritest OTPs! I always start my TTT posts by going through my read shelf, newest to oldest. This was hard, because I really have "met" so many wonderful couples. Don't you lean more horror, mystery, SFF? These are all pure, unadulterated contemporary romance books, and that really is my favorite genre. Thanks for sharing some new to me books. If you ever get the itch to read contemporary or contemporary romance, I have tons of recs. I really need to pick up The Princess Theory. It sounds absolutely delightful. That series is excellent. I have read the first two books, and adored both couples, by Ledi was so fabulous, I had to have her on my list. I've seen Josh & Hazel a few times today (they made my list as well), but I don't know these other couples... I'm getting ready to read The Kiss Quotient next week, but will have to check out some of the others. You are in a for a TREAT, because TKQ was so, so good. If I had gone the YA route, I would have included some fantasy couples. I know you would have recognized a few of those (Kady and Ezra, Lilac and Tarver, Also & Riden, Kaz & Inej, Cas & Em, Hope & Bran). OH MY GOSHHHH I read The Year We Fell Down so long ago and had totally forgotten about how good it was. I might have to do a re-read now!! Great list! Just thinking about Corey gives me the feels. Loved her and loved that she got such an epic pairing. Bowen is always good for me. I avoid romance books so I haven't heard of any of these books. I do like some couples in books but they have to be friends and the romance needs to take a back seat to other plots for it to work for me! Romance is my thing. I love it! I feel like I'm the only person who hasn't read a Christina Lauren book! Their older books are ok, but the ones they have been writing lately have been amazing. The Kiss Quotient looks like a fun read! So fun, but it also had some really meaningful things in there. I didn't quite expect the depth I encountered. These are all new to me, but Bittersweet is actually one I've looked up before! Maybe I'll have to read it. I haven't read any of these yet! I adore Megan (Meghan?) and Prince Ash from The Iron Fey series, though, along with Katniss and Peeta. I focused on my adult couples this time, but if I did a YA version, Meghan and Ash would have made that list. I mean, he literally went to the end of the world for her. I never read THG, but Katniss and Peeta seem to be getting a lot of love today. The only one of these books I've read so far is The Kiss Quotient, and I really do like that couple. I'll have to read that book again someday. It was pretty hot. Michael and Stella were perfection and there was a lot more depth to that story than I had anticipated. Definitely a fave of mine. This reminds me that I still need to read Josh and Hazel. Michael and Stella made my list this week too. Love them so much! I hope you get a chance to read Josh & Hazel. I suggest it for a time, when you need something really fun and zany to read. They were such an A+ couple. Hoang really showed up big with this debut. That is one ship I will go down with. JOSH & HAZEL!!! That book still makes me happy thinking about it months later. Me too!!! Totally smiling right now. So much <3 goodness! Wonderful list Sam! It was hard to choose, but I feel like I included a bunch of great couples. I hope you get to some of them, because they were all hits for me. I did adult romances for this one, but I will do a YA focused one at some point, because those authors are creating perfect pairs too. I want to read a bunch of these. I have The Kiss Quotient on audio and have been meaning to get to it but haven't yet. Bittersweet I want all of these really. I actually listened to TKQ, and I thought it was done well. The story is amazing. I have noting but love for TKQ. Bittersweet was free on Amazon. Maybe it still is?